Ulthera is lifting technology using Focused Ultrasound. It penetrates the deepest layer of the dermis, SMAS (Superficial Musculoaponeurotic System), sending ultrasound frequency that promotes collagen production. Ulthera causes pockets of damage by heating the deep layers of the skin, which stimulates collagen production without operation. Ulthera not only elevates skin on the face and neck but also the brow, eyelids, and droopy eyes including wrinkles under eyes making it clearer and brighter. Ulthera can tighten your face providing V line. Ulthera is considered as the only laser which works from the inside-out to give the best result of lifting and tightening skin. It delivers Advance-Focused Ultrasound energy at depths of SMAS, the same typically addressed in a surgical face lift providing the result lasting for 1-2 years. There's no wound and no downtime with US FDA standard approved. Ulthera none-surgically lifts and tightens skin with no downtime. Before the treatment, applying anesthesia for 45 minutes. During the procedure, you may feel a little painful because of Ultrasound penetrating to SMAS to stimulate the production of new collagen. 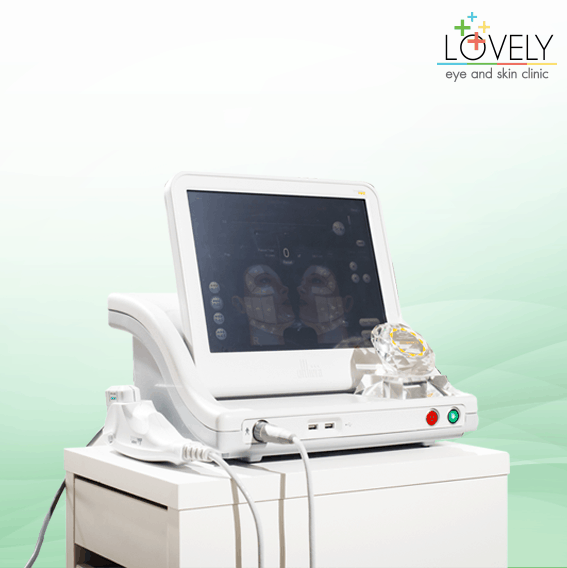 The result can be obviously seen about 30% after the procedure and it reveals improvement within 3 months. You may experience some redness following the procedure which will be disappeared within a week with no downtime and wound. The perfect time for Ulthera is when your skin has relaxed to the point of looking, or feeling, less firm. Improvements can continue for up to 6 months and have been reported to last more than a year following the procedure.